It’s been an exciting couple of weeks for The Catalina Wine Mixer crew. We sold our old dinghy and bought a newer one (a 2007 Achilles HB-315DX, in case you were wondering) which meant that it was time for a new davit system too. Naturally, right? I had no idea what davits were until about a month ago. They’re a system (usually some type of crane or arm) used to raise, lower and store equipment on a boat. Usually a dingy. Anyway, our old system was cumbersome and hard to operate. We needed two strong people to hoist the dingy out of the water and had to remove the motor every time. Such a pain. There are lots of different types of davit systems on the market. And most of them are really expensive (they can run upwards of $10K!) or require pricey professional installation services. So, that immediately ruled out the heavy-duty electrical arm systems and the hydraulic under-swim platform options. It kind of felt like we were Goldie Locks. Everything was too big, too small, and not quite right. Until we found Hurley Marine! Brian reached out to Captain Todd Hurley for advice on which of his systems might work best for our boat. He recommended the H3O, and gave us tons of great pointers about installation, placement, etc. too! 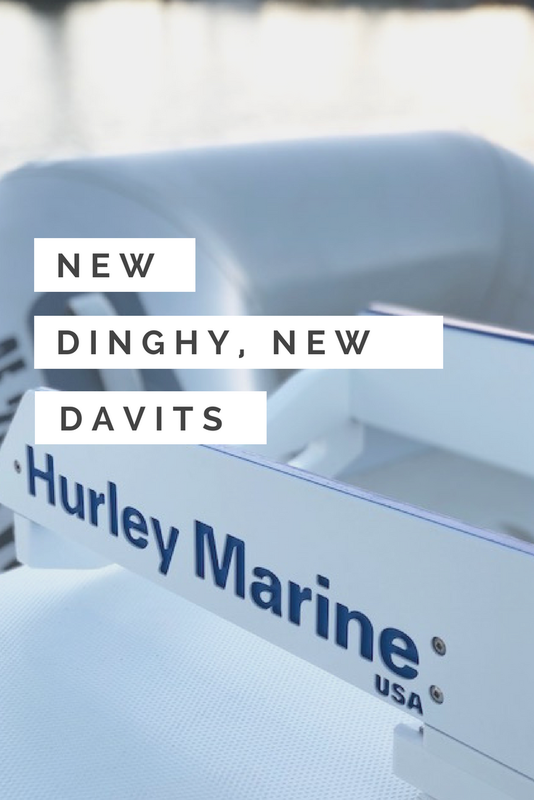 Even better, because we wanted to be able to use the swim platform when the dinghy is stored, Captain Todd let us try Hurley Marine’s brand new swim platform extension (he literally sent us the prototype). We have the honor of being the first customers to install the extension, and we love it! So, here’s the deal with the HurleyH3O: it’s awesome. It literally checked every box on our list – and then some. It only takes one of us to operate, we don’t have to remove the motor every time we haul the dinghy aboard, we can still walk on the swim platform, and the dinghy sits 10 inches above the water line (so it won’t drag in our wake when we’re underway). The system is also reasonably priced AND made in the USA. I’ll be sharing more about the installation process and the nuts and bolts of how it works in my next blog. For now, you can enjoy this incredibly satisfying video of the H3O in action! *Captain Todd was kind enough to give us a discount on the H3O system in exchange for an honest review. Luckily, we think his product is awesome!